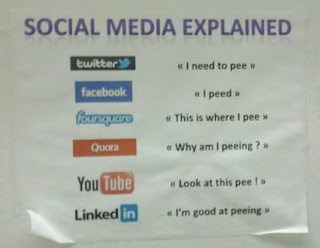 While people debate social media and what all the services do, I found an elegant, yet tongue-in-cheek, image from Adverblog that does the job admirably. From a clarity and classification standpoint, this image delineates a complementary ecosystem owned by the major companies shown. Nearly every social media company who currently or hopes to compete with one of the leaders would overlay one or more of the companies listed. If you agree with not only the implied classification but also the market dominance suggested by the image, then you may also agree that any competitor in that space has a low probability of success due to the ownership of each social media category by an incumbent 800lb gorilla. New entrants, may attempt to introduce product suites, integrated features, or better differentiated features, however the problem is not one of a better product, but one of category ownership. A new entrant with a suite or integrated product must be more than just better with some feature advantage. They need to overcome thought leadership of each of the major competitors that they overlap. I would argue that direct competition for those major segments is over, unless one of those leaders grossly pisses off their user base. The implication for me is that a new entrant must follow a narrower vertical strategy where they can capture both the pain and imagination of a niche market and own it. Yes, the whole of social media will likely follow the path of social networks - products for businesses in narrow verticals where the open access and unsecure information of the current leaders creates social media demand that lacks the privacy, security, and narrow market knowledge that practitioners in a narrow field of focus require. This is not new, of course, as this parallels the growth and segmentation of enterprise software. Where once there was ERP, CRM, and Supply Chain, etc, there are now those software (and SassS) in specific verticals such as government, human resources, finance, automotive, energy, bioscience, medical etc. The only thing that prevents or delays the next wave of vertically focused social media, is the process and structure of demonstrating consistent and repeatable results and ROI in the same way that CRM analytics enabled the creation of pretty charts showing how to identify, cull, and optimize that sales funnel. Where did my review go? Social Media Fail.